A federal judge has swatted down efforts by the Ducey administration to deny licenses to some deferred action recipients even after a federal appeals court ruled that such a move was illegal for others. An attorney for the state asked a federal judge Friday to throw out a lawsuit by some “deferred action” recipients who say they can’t get a license to drive. 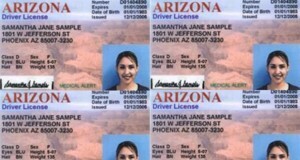 An attorney for the state of Arizona ran into pointed questions from appeals court judges during a hearing on the state's now-reversed policy of denying driver's licenses to young immigrants. State lawmakers are moving to let Arizonans fly off on vacation to New York, Hawaii or even just to Yuma without having to get a passport. Sen. Robert Meza was one of several activists who said Friday that Rep.-elect Jay Lawrence’s proposal to add the words “non citizen” to Dreamers’ driver’s licenses was comparable to Nazi Germany’s efforts to require Jews to wear yellow badges and armbands. With the new year upon us, there are a host of issues state leaders likely will face in 2015. Here are 10 things to watch for in Arizona politics and government for the coming year.